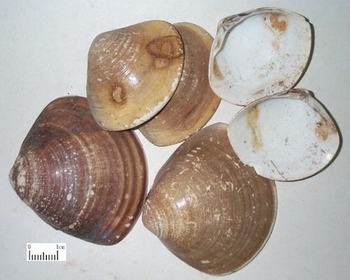 The shell of animal Meretrix meretrix Linnaeus or Cyclina sinensis Gmelin of family Veneridae. Unprocessed, smashed or refined with water, or calcined. Salty, cold; lung and stomach meridians entered. Clear lung and resolve phlegm, soften hardness and dissipate nodulation. This herb is capable of clearing lung heat and resolving sticky phlegm. For phlegm-heat accumulation of lung manifested as cough, dyspnea and fullness and yellow and sticky phlegm, it is usually combined with other lung-clearing and phlegm-resolving herbs and antitussives and antasthmatics. For instance it is combined with Sang Bai Pi, Pi Pa Ye and Xing Ren in Ning Sou Gao from Zhong Guo Yao Wu Da Quan (Great Compendium of Chinese Materia Medica). For chest and hypochondria pain and bloody expectoration caused by burning and damage of lung collateral by exuberant liver fire with phlegm-heat, it is combined with Qing Dai in Dai Ge San from Wei Sheng Hong Bao (A Great Precious Sanitation) to clear liver fire, resolve phlegm-heat, stop bleeding and calm collaterals. This herb not only clears heat and resolves phlegm but softens hardness and dissipates nodulation. For goiter and scrofula due to phlegm-fire congealing, it is usually combined with other phlegm-removing, hardness-softening and nodulation-dissipating herbs. For instance it is combined with Hai Zao, Kun Bu and Wa Leng Zi in Han Hua Wan from Zheng Zhi Zhun Sheng. For long-term illness in weak body, it is combined with tonics to treat with both elimination and reinforcement. For instance it is combined with Ren Shen and Hai Zao in Hai Ge San from Sheng Ji Zong Lu. In addition, this herb has the actions of restraining acidity and alleviating pain so it is indicated for the syndrome of stomachache and acid regurgitation. Decoct 10~15 g with wrapping for the powder. Grind into powder and use proper dose for external application. Better action of clearing heat and resolving phlegm is achieved when used unprocessed and better action of restraining acidity and astringing when calcined.